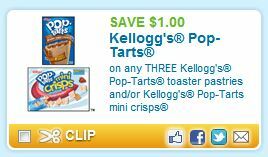 $1/3 Pop-Tarts Coupon + Deal Idea! Wahoo! Another Pop-Tarts coupon just popped up! Use zip code 77477, under Foods to find it fast! Pop-Tarts cost $1.98 at Walmart, so $1.65 a box after coupon. NOTE: To change the zip code, click on the "Local Coupons" tab and enter the zip code, then click the little arrow. THEN, click on the "Coupons" tab to find the regular coupons.